I saw a couple’s “kitty condo” featured on the HGTV special called “Motor Mansions II” this weekend. The Clingers wanted to be able to travel with their 6 (or 8… see below) cats, so they had this custom kitty compartment designed just for them. There is a ramp and door for the cats to enter and exit the main areas of the vehicle, plus a special drinking area and a very private spot for the kitties to do their business. 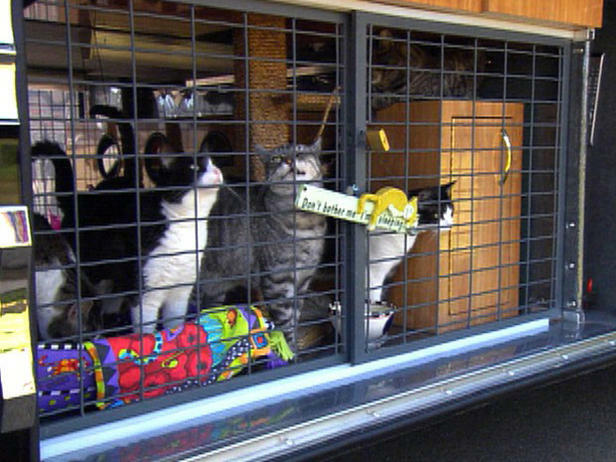 Eight lucky kitties escaped abandonment and drowning to live an enviable life on the road in a custom Country Coach condo. For two years and 20,000 miles, Carolyn and Cub Clinger have provided cozy living conditions, medical attention, custom meals and spectacular sightseeing for this well-traveled cat family. When the Clingers were preparing for their life on the road, they came to Country Coach with a mission. They wanted to purchase a coach that would provide living quarters for their cats and themselves. Recently retired resort owners from the Jackson Hole area, Carolyn and Cub were seeking a coach with a large heated (and cooled) bay area that would offer a source of power. They narrowed their search to the Country Coach Prevost Conversion. Today their cats travel comfortably in a customized living area complete with built-in condos, color TV, separate HVAC controls, specially designed screen doors and a ramp that takes them “upstairs” for “hang-time” with Carolyn and Cub. The Clingers keep close tabs on the ambient temperature in the kitty-quarters via a remote thermometer. One cat suffers from a kidney disorder so it receives specially prepared meals of chicken, shrimp and rice, herbal remedies and twice-daily sub-cutaneous fusions to flush the ailing organs. Prince is a “regular” upstairs for closer monitoring of his health condition. These eight very amiable cats respond to Carolyn and visitors in ways that only the most socialized cats would. Though their venue changes often, the Clinger cats don’t stray. Carolyn slides open the screen door and they come to greet, each one responding to their name. Carolyn beckons, “Come here Miss Molly and lie down on this stool for me.” Miss Molly happily jumps to a stool Carolyn offers outside the coach and immediately curls up, purring contentedly. Carolyn raised these once wild cats since they were 3-day-old kittens, so they think of her as their mother. It all began four years ago when the Clingers discovered the abandoned and nearly drowned cats in their well house. Carolyn rescued the kitties and dropper fed all six of them, despite their veterinarian’s warnings they’d never survive. Ultimately the Clingers had each of these offspring and a consecutive litter, spay and neutered, including the mother, a feral cat that challenged them with capture. “We weren’t cat people,” offers Carolyn. “But we couldn’t leave them to multiply and perish.” Eventually they found homes for some, and planned to keep just three. However, when their resort sold, and a neighbor began shooting at and killing some of their cats, the Clingers packed up all the survivors and set out to find a way to house them in their new mobile lifestyle. Cub and Carolyn’s motorcoach is exquisitely decorated and immaculate from the inside out. Their black PT cruiser follows them wherever they go. Unless you visit the downstairs apartment, you may never know they travel with Macho, Prince, Tory, Skitters, Spikey, Miss Molly, Miss Kitty and Miss Beauty. Carolyn and Cub note they would downsize their cat count, if presented with the right surrogate home. But theirs is, indeed, a hard act to follow. Check out Itty Atcravi’s ATC RV with a 2-story cat condo. Here are some DIY cat condos, towers, and trees. Have a look at these dimensions and prices for outdoor cat enclosures for use in RVs. There’s always this kittywalk, deck and patio enclosure for cats. It’s an outdoor portable cat enclosure system that is safer and more comfortable than cages and pens and allows your cat to enjoy the great outdoors. Thinking about taking your cat with you in the RV?… Read these tips first! Which Cat Cages Are Best?